- Full Screen mode - will allow you to see details of a panorama. - Plasma mode - is intended for making a tour for display on a plasma screen, such as for a exhibition. - Internet Flash Htm XML mode - for creating a Virtual Tour for the Internet. - ScreenSaver mode - for creating Virtual Tour as ScreenSaver. SP_VTB provide multiple ways to present your virtual tour. Professional and beginners alike will be able to build impressive virtual tours. Linking a spherical panorama or cylindrical panorama to build an Executable or Internet based virtual tour. Linking a virtual objects (still photo images, video, executable, SWF,HTML). 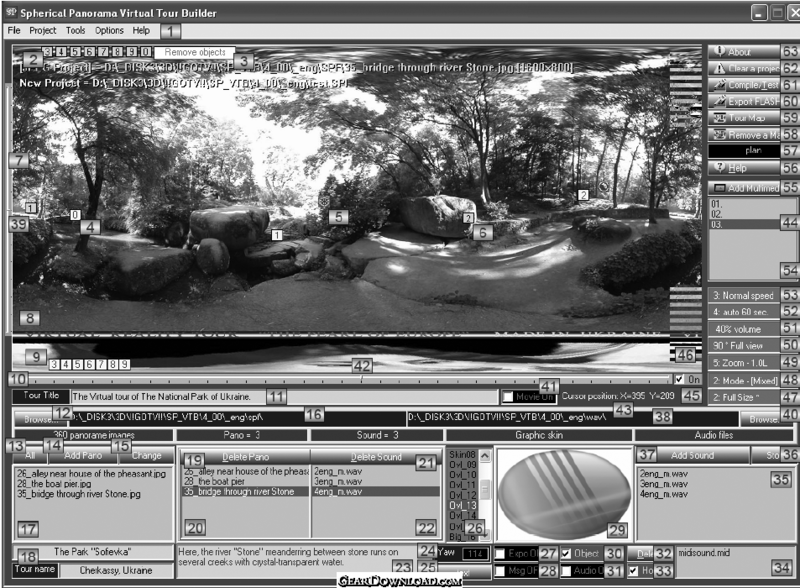 Customize viewer graphic skin and scene visually. Customize visual mode ("Standard","Full screen","Plasma","Internet Flash XML","ScreenSaver"). Adding a hot spots which can be linked to a panorama, a virtual objects or another virtual tour. Set tour path to control the timing and virtual tour walkthrough. Tailor an interactive map with compass effect. Adding Yandex world map with hot spot positioning. Use virtual tour as movie. SP_VTB has been designed to be user-friendly. This download (sp_vtb_8_00.zip) was tested thoroughly and was found 100% clean. Click "Report Spyware" link on the top if you found this software contains any form of malware, including but not limited to: spyware, viruses, trojans and backdoors. PowerPoint Slide Show Converter 3.2.4.2 - Convert PowerPoint presentations into self-running EXE slide shows. NeoBook Rapid Application Builder 5.8.5d - Quickly build your own Windows apps without programming. OutSite-In - Professional Edition 2.3 - Create and distribute CDs from your website. Marketing CD, offline catalogs.